Professional ensembles for your event! We provide a wide variety of ensembles and music selections. Please visit (link hidden) for more information or to inquire about rates and details. We provide a wide variety of ensembles and music selections for all occasions and events. Please visit our website for more information or to inquire about rates and details. Naomi Steckman has been playing the cello since the age of three. She has studied both classical and contemporary music with professors at Berklee College of Music, New England Conservatory and Boston University, and has since worked with teachers from the Boston, Richmond, Chicago, Seattle and National Symphonies. Naomi is currently a freelance cellist in Boston, and plays with a variety of ensembles sitting both as a section cellist, substitute cellist and principal. These ensembles include the Ohio Light Opera, as well as symphonies in Lancaster, PA, Huntington WV, Roanoke VA, Winston-Salem NC, Charleston SC, Fayetteville NC, Norfolk, Virgnia Beach and Richmond, VA. In addition to playing with symphonic ensembles Naomi has recorded and played in a vast range of venues and studios playing music ranging from classical, jazz, to pop. How long do musicians usually play for? “Ceremony only” consists of 30min. of prelude music (while guests are being seated), the processional (1-2 selections for parents/grandparents and bridal party), bride, any ceremonial music (candle lighting, communion or other religious ceremonial customs that would require music), recessional and a 10-15min. postlude (after the bridal party has exited). This package also covers the two-hour rehearsal that is necessary to prepare for the event. Can the musicians play outdoors? Yes- However, necessary accommodations must be included to protect the well being of the instruments. These accommodations include weather conditions to be 60 degrees or higher, a dry leveled surface in a shaded area and if there is unexpected inclement weather, then a heated enclosed space must be provided. 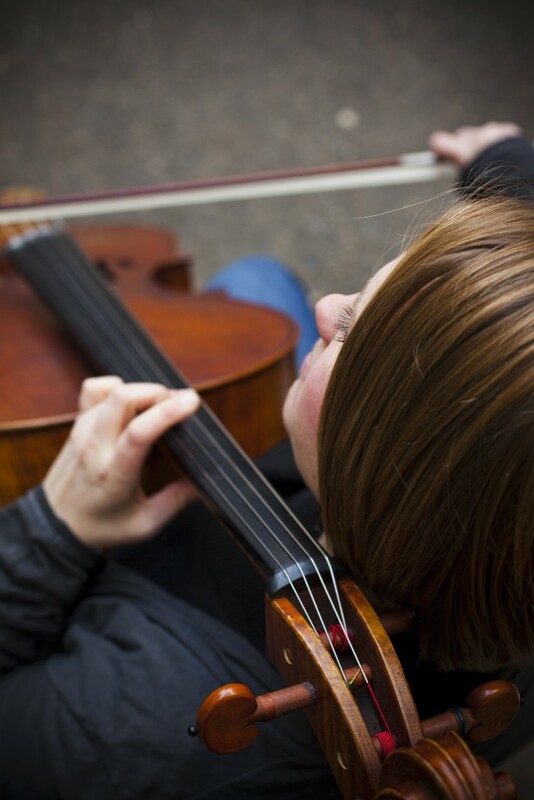 Why is hiring a solo musician almost as much as hiring other ensembles? When a musician has to play solo, they need many more hours of rehearsal time in order to prepare the repertoire needed for the event. As a soloist, the musical “work” falls on that one player, instead of dividing it up among two to four other players. Do you have a list of repertoire to choose from? If I don’t see a selected piece of music in the repertoire listed can I make a special request? Yes- Arrangements can be made upon request for an extra fee. How much do arrangements cost? The fees of the arrangements vary depending on the popularity of the piece requested and the type of ensemble that the piece is being requested for. If it is a popular tune that is easily purchased, the client will be asked to provide the amount that it will cost for the purchase which can range from $10.00-$50.00. However, if the selection has to be arranged from scratch, the fee is $75.00. If I hire an ensemble that includes harp are there any extra fees or accommodations that I need to be aware of? Yes- There is a small cartage fee of $50.00 that will be included in your overall total cost that covers the transportation of the harp. Outdoor accommodations are the same as for other instruments. Is it customary to tip the musicians and how much is required? Yes- However, tips are not required but are encouraged if a client feels that the performance deserves extra gratitude for the services provided. The amount of the tip is up to each individual client. Is there an extra fee if the musicians play the rehearsal dinner?